Should we breed the vaquita in captivity? For as long as we have known about the vaquita, gillnets have been killing more individuals than are being born. The upper Gulf of California has been a danger zone for the species ever since humans started fishing there, and unfortunately, vaquita don’t live anywhere else. Even though gillnets are now permanently banned in the vaquita’s range, there will still be illegal fishing if compensation and/or nighttime enforcement issues are not fixed immediately. These are indeed desperate times. So desperate, in fact, that no option is off the table when it comes to salvaging this species. The idea of ex-situ conservation (captive breeding) for the vaquita has not been given much thought, until recently. “The issue of possible live-captures and ex-situ conservation (generally known as captive breeding) of the vaquita has recently been much talked about and debated. This results from the 2016 CIRVA report, which for the first time, recommended evaluation of the prospects and steps needed for captive breeding of the species, as part of the conservation plan. This is a very complex issue, and there are a variety of different views within our organization on this proposal. We will not allow the vaquita to go extinct, which means if captive breeding is the only option left, we will try our best to accomplish it. There is still a long way to go in terms of determining whether or not it would be safe for the animals (some porpoise species do well in captivity), or how we would do it (underwater pen in the Gulf, tank on land, etc. ), but if necessary, we could have captive vaquitas by next year. Too much later, and there may be no vaquitas left to save. Make the gillnet ban permanent! These are not going to be easy to accomplish, but Mexico certainly has the power and will to make them all a reality. We need to show our support and clarify exactly what needs to be done to save this species. But how can I tell the Mexican government these four things? How can I make my voice heard? Now there is an easy way. These people are extremely influential and literally have the power in their hands to save the Vaquita. If they agree to the four things above, the Vaquita will most likely thrive. Signing the petition is extremely easy. All you have to do is fill in your name, email address, etc. and press Sign! Or you can log in to Change.org with Facebook or email, and literally just click one button to sign! If there is one thing you ever do for the Vaquita, make it signing this petition. Thank you from the VV coalition and the Vaquita. And don’t forget to support the Thunderclap! There is no feeling worse than sitting in a waiting room and having no idea what is happening to your loved one in the E.R. You wish you could be there to see what is going on, or better yet, help in any way you can. But you can only sit in the waiting room, staring at the floor and praying to any god out there. The Vaquita’s situation is no different. The well-being of the patient (Vaquita) is now fully in the surgeon’s (government’s) hands, while we can only sit in our own little waiting rooms and hope that they do the right thing. Nothing is harder for conservationists than feeling powerless. However, we still can help by doing the little things. Signing petitions, spreading awareness, donating to conservation groups, and avoiding unsustainable Mexican seafood can only help the situation. The 2-year ban has officially been underway for a few weeks now, but there is still much uncertainty as to what really is happening in the Gulf. The shrimp fishermen are not our enemies. Most of them are willing to stay out of the exclusion zone and genuinely care about the Gulf ecosystem, but we can’t expect them to do so without any help or compensation from the government. The poachers of course are a different story. The Mexican Navy has continued to make Totoaba busts, which is very positive news. The poachers are the biggest opponent on the water. They are armed and dangerous, which is why the Navy is the only realistic option for arresting them. We need to keep the pressure on the Mexican (and U.S.) governments to really make sure they follow through with all their bold promises. If they do, the Vaquita is going to recover. ‘Ninety years after its founding, the port of San Felipe, Baja California, is not going through its best moments. Illegal fishing of Totoaba (Totoaba macdonaldi) exerts a negative pressure on the Vaquita (Phocoena sinus) population by increasing the threat of by-catch death due to the use of gillnets to capture the Totoaba. Under increasing national and international pressure, the Mexican government has decided to implement a two-year ban on the use of gillnets and longlines in the Upper Gulf of California, since these place the Vaquita at great risk. Although it is true that there is talk of an economic compensation for the fishermen and the fisheries production chain, which will also be affected by this strategy, the economy of the port of San Felipe will receive a great blow, the magnitude of which is still unknown. The nervousness created by the ban that will begin in April is one of the factors that make this situation in the Upper Gulf complex. In the last weeks, the region has seen the rise of fuel prices, some paying up to $14 pesos a liter for regular unleaded. In the face of the elevated cost of fuel, the population is asking the government to keep the price equal to that of the city of Mexicali, B.C., since the port belongs to the municipality of the capital of the state, and the difference in prices is excessive. Low volumes of fish catch and high gasoline prices lower profits for fishermen. Gasoline represents the highest among the operation costs of a fishing vessel. As the beginning of the ban approaches and fishermen are looking for ways to adapt to the rising fuel prices, they have also had to deal with a no-fishing sanitary ban caused by a red tide. The red tide has been happening for more than a month and the fishing ban on bivalve mollusks has not been lifted, another blow for the economy of the port, since producers for geoduck and other affected species have not been able to commercialize their product during this time. The geoduck fishery is one of the most important for this port; just in 2006 it generated more than $80 million dollars for the state of Baja California. Even though red tides are naturally occurring events, and not all of them result in sanitary bans, the frequency and magnitude can increase due to factors like pollution and even elevated water temperatures. It is the first time in a long time that a red tide is registered to extend all over the Upper Gulf of California (from Puerto Peñasco to Bahia de Los Angeles) and for such a long period of time. In the midst of these events the fishermen of San Felipe are in a situation of uncertainty. Fishing is the principal source of income and with the suspension of the use of gillnets it is difficult for the sector to visualize a prosperous future in the Upper Gulf of California. According to a document drafted by SAGARPA the value of shrimp, finfish and shark production for San Felipe is $177,256,500 pesos annually. An independent study carried out by the Gulf of California Marine Program calculates that just the chano, Spanish mackerel, gulf corvina, and shrimp fisheries have an estimated annual value of $208,982,142 pesos for the community. The federal government will allocate more than $400 million pesos to compensate the fishermen of the Upper Gulf for the economic losses that the ban of gillnets will cause. In addition, it will invest more than $28 million pesos to compensate members of the productive food chain. On the other hand, not everything is tragic. Government agencies like Sepesca-BC, CONANP, and CONAPESCA will offer support and financing programs for aquaculture and mariculture projects, among others, aimed at fishermen and cooperatives. These are alternatives for the fishermen’s economy and therefore, for the port. In the next two years it will be extremely important to invest in infrastructure for the port to guarantee the well being of the sector and absorb the economic blow that the region will suffer. Some fishermen will be able to participate in monitoring activities, for which the government has destined a little over $80 million pesos. In addition, there is also the possibility of continuing their fishing activities, as long as they use alternative fishing practices like traps and hook-and-line (commonly known there as “piola”). Sports fishing can become a profitable alternative since San Felipe is a well-known destination for national and international fishing aficionados. ‘U.S. conservation groups petitioned the World Heritage Committee today to designate more than 6,900 square miles of ocean and islands in northern Mexico as “in danger” due to the urgent threat of extinction of the critically endangered Vaquita porpoise and Totoaba (a fish species) in the Gulf of California. The World Heritage Committee may consider the petition at its annual meeting in Bonn, Germany, this June. Although the World Heritage Committee designated Mexico’s “Islands and Protected Areas of the Gulf of California” as a World Heritage property in 2005 in recognition of the area’s outstanding biodiversity, the Vaquita and Totoaba now face extinction as a result of fishing activities, including poaching. 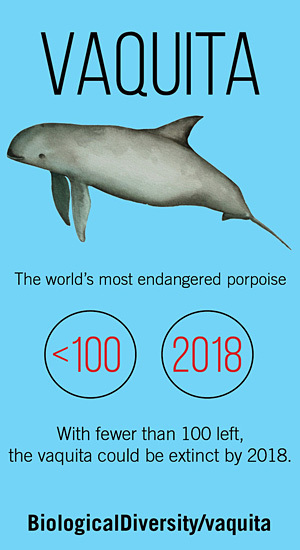 The Vaquita is the world’s smallest porpoise and exists only in Mexico’s Gulf of California; the species has suffered a dramatic and alarming decline, with fewer than 100 animals remaining. Without help, scientists predict, the Vaquita could be extinct by 2018. Under the World Heritage Convention, a property may be listed as “in danger” if there is a “serious decline in the population of the endangered species” that the property was established to protect, like the Vaquita and Totoaba. An “in danger” designation, the conservation groups advocate, will focus international attention on the species’ plight and may garner much-needed funds for the area’s conservation. Vaquita are often entangled in shrimp fishing gear and illegal gillnets set for Totoaba, a six-foot-long, critically endangered fish that is also only found in the Gulf of California. The Totoaba’s swim bladder is highly sought-after to make soup and for unproven treatments in traditional Chinese medicine. The species faces an increasing demand in the global black market, as a single Totoaba bladder can sell for USD $14,000. Today’s petition follows Mexico’s announcement last month of a two-year ban on most gillnets in the northern Gulf of California and a promise of increased enforcement. While these measures are critical steps forward, the area requires permanent protection to ensure the two species’ future. Another thing to keep in the back of our minds is a boycott on all Mexican seafood. At this time the embargo is not in action, but we are prepared to boycott all Mexican seafood products if gillnet fishing continues and the Mexican government does not stop it. Later this year, there will hopefully be an official Vaquita survey by NGOs and the Mexican government to get the most accurate and up-to-date population estimate. After filming a Vaquita for the first time since 2013 (see previous post), Sea Shepherd’s Operation Milagro has made another big progression. They announced a partnership with the Mexican government that will enable Sea Shepherd to collaborate with them and also help patrol the exclusion zone. Read more here. This is going to be a big summer for the Vaquita. We will all be on the edge of our seats waiting to see what the Mexican government does, and then acting based on that. A lot of exciting things are going on behind the scenes at VIVA Vaquita HQ, including planning for International Save the Vaquita Day 2015, on July 11! And on Sunday, June 7 from 11:00 am-4:00 pm, I will have a Vaquita table in Boston at the New England Aquarium’s World Oceans Day celebration. Please join me! “EFFORTS TAKEN TO date by Mexico, the United States, and the global community have been helpful, but have not been sufficient to save the Vaquita from extinction. Conserving the species will require a fundamental change in the nature and rigor of recovery efforts—to save the Vaquita the next round of protection measures cannot be half-hearted, indecisive, or poorly implemented. We need a strategy that can be implemented immediately and then sustained for the long-term—it is simply disingenuous to suggest anything less will do. The following are twelve tasks that must be accomplished if we are to prevent the Vaquita from vanishing from the face of the earth. Remove—in perpetuity—all gillnets from the species’ full range, including those that are being used legally to catch shrimp and finfish, and those that are being used illegally to catch the endangered Totoaba. We have long known that gillnets are the primary factor causing the decline of the Vaquita. Staunchly enforce the prohibition on gillnets using both aircraft, vessels, and aggressive judicial retribution. A prohibition on gillnets is effectively meaningless unless the Mexican government enforces that prohibition. Require all fishermen currently using gillnets to fish for shrimp to shift immediately to small trawls (e.g., red selectiva) if they want to fish within the historic range of the Vaquita. Small trawls are used effectively to fish for shrimp in other parts of the world and they have been shown to be effective in the northern Gulf of California. Switching gears will require some adaptability by fishermen, but does not pose an insurmountable problem. Require all fishermen currently using gillnets to target finfish to shift immediately to alternative, Vaquita-safe gear if they want to fish within the Vaquita’s historic range. An entangled Vaquita will drown in a gillnet used for finfish just as quickly as it will drown in a shrimp gillnet. Work with the United States, China, and other Asia nations to end the illegal fishing and trade of Totoaba. Gillnets are being used illegally to fish for the endangered Totoaba; the swim bladders of these fish are then sold in Asian black markets. Few human activities are as destructive to endangered wildlife populations as these absurd black markets. Begin training programs to educate and train fishermen in the use of new, Vaquita-safe fishing gear for both shrimp and finfish. Vaquita recovery efforts are not intended to harm fishermen, who will require assistance to shift to safe gear types. Support the work of international scientists to maintain the acoustic monitoring system developed over the past 5 years. Keeping track of the status of the remaining Vaquita population is critical to guide recovery efforts. The acoustic monitoring system used for this purpose is the best possible monitoring strategy available under these circumstances. Bring the full weight of key administrative departments and agencies to bear on this issue. Those include the Department of Commerce (including the National Oceanic and Atmospheric Administration and the International Trade Administration), the Department of State, the Department of the Interior (including the Office of Law Enforcement in the U.S. Fish and Wildlife Service), and the Marine Mammal Commission. Conservation organizations also are key partners in this recovery effort. The Department of Commerce, including NOAA and the International Trade Administration, must implement a full embargo of all seafood products caught in all Mexican fisheries if all gillnets are not removed immediately from the Vaquita’s historic range. NOAA also must continue to provide scientific expertise to Vaquita recovery efforts. The Department of State must send a message of strong concern to its Mexican counterparts regarding the pending extinction of the Vaquita. That message must convey that the United States stands ready to assist with recovery efforts, but that it also expects Mexico to implement, in a full and effective manner, the recovery measures needed to save the Vaquita. The Department of State also must make it clear to their Asian counterparts that the United States fully intends use all means available to it to stop the illegal trade in Totoaba. The Office of Law Enforcement of the U.S. Fish and Wildlife Service, Department of the Interior, must lead efforts to halt the illegal trade of Totoaba parts. Much of the illegal trade apparently goes through southern California, but it must be halted in all areas under U.S. jurisdiction. Conservation organizations are key partners in this recovery effort. Funding will be needed to support recovery efforts by the Mexican and U.S. governments. The conservation community may have access to resources not otherwise available to government departments and agencies, and they have the flexibility to respond more quickly to funding needs. They bring up some great points in this article. First, they address that the Vaquita is in a better situation than most other endangered species. Obviously they are still in deep trouble, but in essence, if we can’t force ourselves to save the Vaquita, we might as well give up on the species that have more complicated threats. Basically, this is article is a list of things that the governments of Mexico and the United States must accomplish to save the Vaquita. You are kidding yourself if you don’t believe the government is the only thing controlling the fate of the species. The government is what creates, implements, and enforces all the laws. The government is the only thing that can stop fishermen from using gillnets. So, where does that leave us civilians? Spreading the word, and especially these petitions, puts tremendous pressure on the government to implement the necessary plans to save the Vaquita. The official 2-year ban on all gillnets in the Vaquita’s full range was supposed to begin on March 1, but now it has been postponed to begin a month later, on April 1. We hope this delay was only because they still needed time to finalize legalities, distribute compensation, and prepare to enforce the ban. We need to make sure the Mexican government is 100% serious about this ban, because otherwise, there is absolutely no chance for the Vaquita. And before the next two years are up, the Mexican government needs to create a long-term plan. But this two year ban, if properly enforced, is a perfect first step. It should allow enough time for the development of Vaquita-safe nets for every type of legal fishery, and also be a test for the Mexican government to see if they can enforce a ban successfully. The illegal Totoaba fishery will prove an extremely difficult test to stop, but if enough people work together, it can be done. The next few years are going to be remembered forever as either a complete failure to solve a relatively simple environmental issue, or as one of the greatest conservation success stories of all time. Let’s make it the latter. 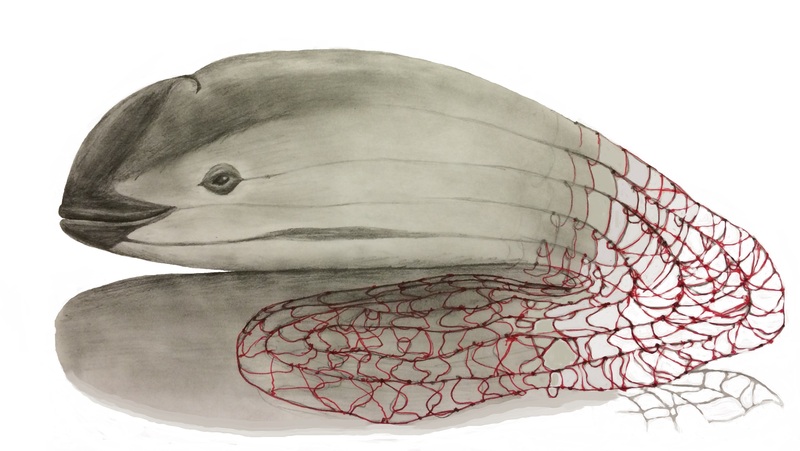 This is a drawing called “Morph.” It represents the complexity of the Vaquita’s situation by showing how vague the difference between the Vaquita and its killer—the gillnet—is. Is there a good side? Or are they both good—or neither? I believe that this is one of the few situations where the murderer is not an antagonist. The fishermen are people with families that are doing all they can to keep food on the table and a roof over their heads. The Vaquita is an innocent little porpoise that has never harmed a human being, yet has been forced to don the title of most endangered marine mammal. Their predicament is the unfortunate side effect of an economically efficient fishing method. There will never be a story about the Vaquita without mention of gillnets. They go hand-in-hand, and always will. Let’s just hope that in the future we will be talking about the Vaquita’s conquering of gillnets, not vice versa. In the end, it is up to the fishermen to make a very difficult choice: illegally fishing for temporary wealth but driving the Vaquita to extinction and destroying the Gulf’s ecosystem, or switching to admittedly expensive alternative gear that preserves the Vaquita and the food chain as well as giving their families eventual wealth. Our job is to convince them to choose the second one. In addition to spreading the word on social media, an undeniably great way to help with this problem is by donating. $50 can eliminate an entire day of gillnetting. Please consider clicking below and donating to what I believe is the worthiest cause on the planet, brought to you by GreaterGood.org. Thanks from the Vaquita. As the year draws to a close, WWF takes a look back on the wonderful year of 2013 in their “15 WWF Success Stories of 2013.” Of course, the biggest Vaquita news in recent memory took place this June in the form of the Official Norm law, a new regulation that guarantees that all shrimp gillnets will be phased into Vaquita-safe trawls within the next 3 years! The Vaquita is featured at number 6 on the list because it was WWF’s petition (which garnered over 38,000 signatures from 127 countries) that caused the law in the first place. We cannot give enough thanks to WWF and everyone else that has helped the Vaquita so far in its eventful, 55-year history with us (the Vaquita was discovered in 1958). Let’s have a toast to a great 2014 for the Vaquita! My sister and I came up with a fun holiday activity to find out your Vaquita name! 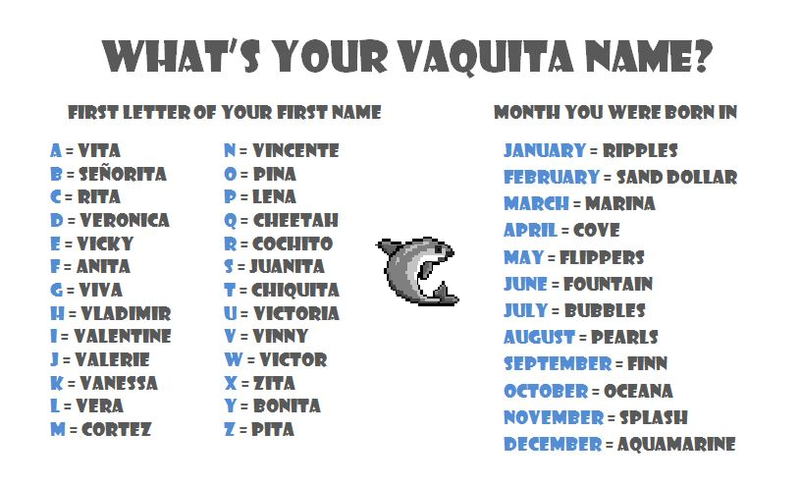 For example, my name is Aidan and I was born in March, so my Vaquita name would be, “Vita Marina.” Have fun and please share! Lately I have been thinking a lot about saving the Vaquita…I mean really saving the Vaquita, not just blurting out words and ideas without even fully processing what we are saying. Saving a species has become such a widely used term that we sometimes forget to dig all the way down to the roots of the problem. As the quote above by American philosopher John Dewey states, we need to reflect on our experiences to learn something. In this case, our experiences would be conservation success and failure stories. I decided to look for patterns in the successful species recoveries, as well as in the ones that were not so lucky, to determine what can and should really be done to save the Vaquita. So what do all of these success stories have in common? The answer is we actually did something. We tried. Scientists started captive breeding programs. Conservationists created protected areas. We made sure we protected the species with every last ounce of energy we could. A captive breeding program unfortunately could not work for the Vaquita because they don’t survive in captivity, and even if they did, they would be virtually impossible to capture in the first place. And don’t even get me started on the whole SeaWorld issue (I am getting Blackfish for Christmas). Our main goal to help the Vaquita should be to really try, and I don’t just mean conservationists. Everyone, fishermen, public figures, governments, and the citizens of the world need to band together to save a species that cannot save itself. We already have multiple protected areas for the Vaquita, which is a great start, but as I’ve said many times before, the areas do not completely cover the porpoise’s full range. And enforcement on these protected areas is not as strong as it needs to be, which is hopefully changing. Fortunately, animals with smaller populations and more dangerous habitats than the Vaquita have come back from the brink of extinction, so it is still not too late. So what did we do differently? As you might expect, the exact opposite of what we did in the successes: absolutely nothing. As with basically every endangered species on the planet, these animals are being destroyed by us humans, much like the Vaquita is. Yet we did not take the responsibility of helping our innocent victims. Many of these failures are due to a lack of understanding or control over the threat. Luckily, the Vaquita is in a perfect habitat with only one problem: accidental entanglement in gillnets. Bycatch is a much easier-to-deal-with threat than poaching or trapping because it isn’t even intentional, and climate change because it is a direct threat. With the right teamwork, the Vaquita can definitely be saved. So in recap, we learned that we can save the Vaquita by, well, saving it. We mustn’t sit around and hope it survives. We need to take action now, before the Vaquita itself becomes an experience to reflect upon.